All couples will now be allowed to have two children, the state-run news agency said, citing a statement from the Communist Party. The controversial policy was introduced nationally in 1979, to reduce the country’s birth rate and slow the population growth rate. However, concerns at China’s ageing population led to pressure for change. The one-child policy is estimated to have prevented about 400m births since it began. Couples who violated the policy faced a variety of punishments, from fines and the loss of employment to forced abortions. Over time, the policy was relaxed in some provinces, as demographers and sociologists raised concerns about rising social costs and falling worker numbers. His post was shared more than 1,900 times, and news of the deal has made headlines around the world. Tzafrir, an Israeli Jew, is a latecomer to hummus — and a true believer in its powers. Growing up in the suburbs of Tel Aviv, he ate mostly packaged hummus from the supermarket. When he was about 20, he tried his first bowl of freshly ground chickpea paste, served hot, at an Arab restaurant — and he became an evangelist. Hummus is ubiquitous across the Middle East. A 2012 film, Make Hummus Not War, documented the competing Palestinian, Lebanese and Israeli claims to the chickpea paste. 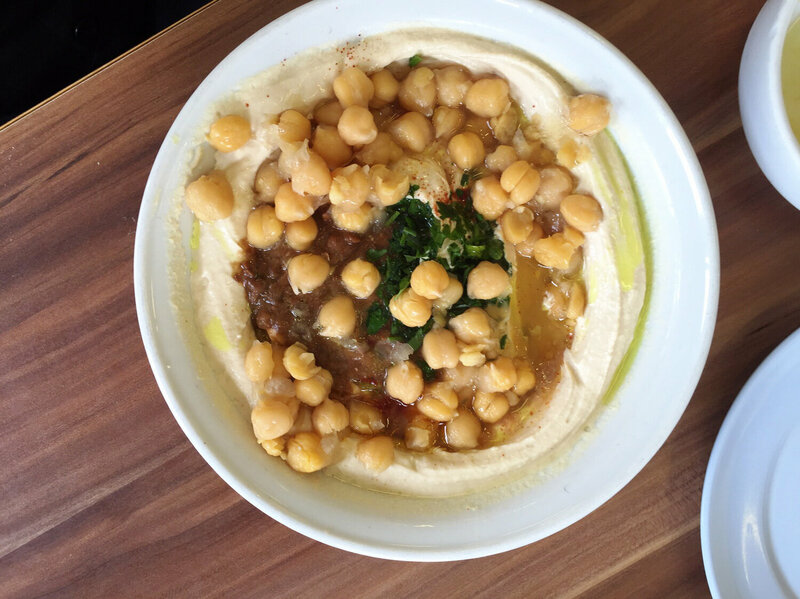 In recent years, at least one new hummusiya, or hummus restaurant, has opened every week in Tel Aviv, according to Shooky Galili, an amateur hummus historian in Tel Aviv and author of the comprehensive review site humus101.com. Tzafrir opened Humus Bar four months ago. Since announcing his hummus peace deal earlier this month, Tzafrir says only about 10 tables of Arabs and Jews have received the discount. But, he says, business is up by at least 20 percent — even if a substantial part of the boost is from local and foreign journalists. Galili says hummus has a long history of bringing Arabs and Israelis together. Before the founding of modern Israel in 1948, Jews in the area would eat hummus in Palestinian restaurants as a way of showing fearless bravado, he says. And even today, he says, a well-known hummus restaurant will draw Israeli Jews into Arab neighborhoods and towns they would otherwise have no reason to enter. About a fifth of Israel’s population is Arab. Many Arab Israelis have close family ties to Palestinians in the West Bank and Gaza Strip. A bowl of Kobi Tzafrir’s hummus. Both Israelis and Palestinians love the hummus chickpea paste. Tzafrir is trying to use this shared love to bring people together. But in the current atmosphere in Israel, hummus restaurants have become a litmus test of race relations. Since October, Palestinians have killed 10 Israelis in a series of stabbings and shootings. Israeli security forces have killed at least 48 Palestinians, including Arab Israeli assailants, in the same period. In this environment, Israelis who normally visit Arab restaurants have been shying away from them. Abu Hassan, a boisterous hummus restaurant in Jaffa, the Arab quarter of Tel Aviv, has seen business plummet in recent weeks. Its Facebook page is filled with posts from customers expressing their shock at the lack of the usual snaking lunch line. In early October, Tel Aviv Mayor Ron Huldai posted a photo from a hummus meal at a different Jaffa Arab restaurant. “The hummus is fantastic as ever, just come,” he wrote. Israelis were quick to respond. “They wait tables by day, throw stones and fly Hamas flags by night,” one commenter said. “Bon appetite, we’re eating at Jewish places,” another added. On Thursday at Humus Bar, lunch business was brisk. Several Jewish Israeli customers dropped in from work for a bowl of hummus, topped with warm cooked chickpeas, hot fava beans, or stir-fried mushrooms and onions. Tzafrir took care to make every plate of hummus himself, dusting each with paprika, cumin, olive oil and chopped parsley. He says he has not yet trained his staff in how to put together the perfect serving. Shiran, who is Jewish, says she grew up in northern Israel, in Jewish towns surrounded by Arab villages, where she had good relations with her neighbors. But now, she says, it’s dangerous to venture into Arab towns. “I will not go to Jaffa until the situation calms down,” she says. Amin Tabri, a Palestinian from east Jerusalem, was one of the few Arab customers. He was visiting Humus Bar with colleagues — including Jewish ones. Tabri says he’s keeping his three children home these days because he fears for their safety. The Black Lives Matter network will skip a presidential endorsement but keep up its political activism by confronting candidates about the treatment of African-Americans in the United States, one of the group’s founders says. In an Associated Press interview, Alicia Garza discussed the organization’s refusal to settle on a preferred candidate in the 2016 race to succeed President Barack Obama and pledged to press ahead with protests and interruptions during the campaign. “Sometimes you have to put a wrench in the gears to get people to listen,” said Garza, who spoke at the 7th Annual Black Women’s Roundtable Policy Forum last week. The Black Lives Matter movement traces its roots to the fatal shooting of 17-year-old Trayvon Martin in Florida in 2012, and gained national ground after 18-year-old Michael Brown was shot and killed by a white police officer in Ferguson, Missouri, last summer. Since then, deaths of other unarmed black males at the hands of law enforcement officers have inspired protests under the “Black Lives Matter” moniker. Some are affiliated with the original network founded by Opal Tometi, Patrisse Cullors, Garza and their allies. Some are not, although they use the slogan. While the Black Lives Matter groupwill not officially endorse any candidate, Garza said any member of the group is free to do so on their own. Black Lives Matter activists grabbed headlines when they disrupted a Seattle rally last month right before Vermont Sen. Bernie Sanders, a Democratic presidential candidate, was about to speak. Others claiming to represent Black Lives Matter have met with Democratic presidential candidate Hillary Rodham Clinton and Republican presidential hopeful Jeb Bush. The Congressional Black Caucus, a group of African-American lawmakers in the House and Senate, also was focusing on criminal justice and police reforms during its annual legislative conference this weekend. The network said the resolution would not get its endorsement, and Garza reaffirmed that the official Black Lives Matter organization will not endorse any political party or candidate this election cycle. The group said in the future it may endorse candidates or even run candidates of their own. Pictured is Renda Writer, a muralist expressing his support for the movement one word at a time on a Detroit art gallery exterior wall. “It’s too early in the development of the network and it’s too early in the genesis of the movement to rally around anyone in particular who hasn’t demonstrated that they feel accountable to the Black Lives Matter movement or network,” said Garza, who also works with the National Domestic Worker Alliance. Dr Keise Izuma collaborated with a team from the University of California, Los Angeles (UCLA), to carry out an innovative experiment using transcranial magnetic stimulation, a safe way of temporarily shutting down specific regions of the brain. The researchers targeted the posterior medial frontal cortex, a part of the brain located near the surface and roughly a few inches up from the forehead that is associated with detecting problems and triggering responses that address them. In the study, half of the participants received a low-level “sham” procedure that did not affect their brains, and half received enough energy to lower activity in the target brain area. Next, all of the participants were first asked to think about death, and then were asked questions about their religious beliefs and their feelings about immigrants. The findings, published in the journal Social Cognitive and Affective Neuroscience, reveal that people in whom the targeted brain region was temporarily shut down reported 32.8% less belief in God, angels, or heaven. They were also 28.5% more positive in their feelings toward an immigrant who criticised their country. The investigators asked participants to respond to both negative and positive emotional aspects of religion and of nationalism. Specifically, they rated belief in the Devil, demons, and Hell, in addition to God, angels, and heaven. All potential participants were pre-screened to make sure that they held religious convictions before beginning the experiment. With regard to nationalistic ideology, the participants read two essays ostensibly written by recent immigrants. One essay was extremely complimentary toward the United States, and the other essay was extremely critical. The investigators found that the magnetic stimulation had the greatest effect on reactions to the critical author. “We think that hearing criticisms of your group’s values, perhaps especially from a person you perceive as an outsider, is processed as an ideological sort of threat,” said Dr Izuma. “One way to respond to such threats is to ‘double down’ on your group values, increasing your investment in them, and reacting more negatively to the critic,” he continued. The scientists say that whether we’re trying to clamber over a fallen tree that we find in our path, find solace in religion, or resolve issues related to immigration, our brains are using the same basic mental machinery.